The MetroKitchen team landed in Chicago on an unusually warm day in the windy city, Chicago. We trotted off to McCormick Place, the home of the 2009 International Home & Housewares Show (suitcases and all!). We were excited to see what new products would be showcased. The Housewares Show was a great place for the MetroKitchen team to see what products our top brands were introducing for the new year, and to check out new and upcoming brands in the cookware/cutlery/small appliances realm. Besides noticing the obvious, the show seemed more empty than in prior years, most likely due to the current economy. We also noticed there were not very many new innovative products being launched this year. also “sign of the times”. One trend in products, offered by several brands was the all-in-one oven or electric cooker. With the success of the All-Clad Slow Cooker, its no wonder other brands are catching on. In today’s busy world, customers are looking for quality cookware, producing quality meals, in a shorter time while being more energy efficient. Induction cooktops are also continuing to grow its reputation, as the way to cook your food. We found our trip to the Home and Housewares Show to be highly productive and lots of fun. We were able to sneak in some fun as well, such as a late night beer and Chicago deep dish pizza and a trip to the Rock ‘n Roll McDonalds! Of course we got to mingle and meet with some celebrity chefs. 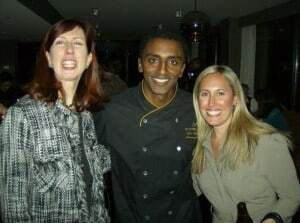 We had a great time at an event held by Chef Marcus Sameulson at his restaurant C-House. Roof top cocktails and tapas was a great way to end an eventful day. We love Marcus Cookware, and look forward to seeing his newest products on tap for 2009.